Phone booths are a rare sight these days thanks to mobile phones, but Londoners will soon find themselves seeking one out when their mobiles need a charge. 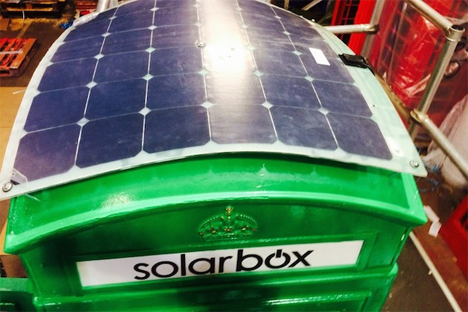 Solarbox London is a project that aims to re-use the iconic red call boxes in London as mobile phone charging stations. Lovers of classic London imagery will balk at the idea of painting the phone booths green, but overall it’s for a greater, greener, good. 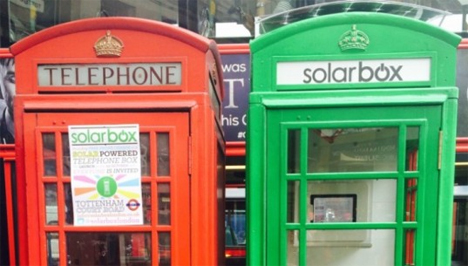 Thanks to Solarbox London, some of the city’s remaining red phone boxes will be equipped with 150-watt solar panels on their roofs and chargers for a variety of phones. Based on the strength of the solar panels, each box should be able to provide battery charges to approximately 100 phones per day. Early tests of the six charging stations already installed show that they can provide a 20% charge in 10 minutes, which is ideal for commuters who just need a bit more juice to make a call on the way home. 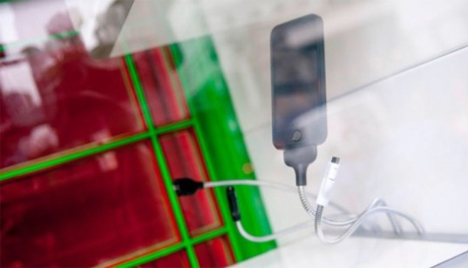 Users won’t have to pay money to use the Solarbox chargers; however, they will be subject to advertising that displays on a screen inside the box while their device is being charged. Each box will be open and available for charging 365 days a year from 5:30 am to 11:30 pm. Although plenty of people have tried to repurpose the red phone boxes into art, wi-fi hotspots, and a variety of other purposes, the Solarbox gadget chargers seem to make the most sense for the city. They’re practical, they’re financially supported by advertising, and they do a public service. Now if they just didn’t have to paint the red boxes green, we’d all be happy. See more in Energy & Power or under Science. October, 2014.